Friends from our Sail Alaska adventures, John and Deb, flew into Loreto last week where we picked them up via rental car and dinghy. After waiting out the final night of a three-day blow in Puerto Escondido, and filling the lockers with fresh fruit and other supplies of the liquid variety, we were off! Our first stop was Bahia Salinas on the north-east side of Isla Carmen. To get there we sailed around the north end of Isla Danzante, then through the gap between Danzante and Carmen. The wind started picking up slightly from the south, so we loosed the Goose for a bit until the wind did a 180 degree turn and started blowing on our nose. We doused the goose, unfurled the Genoa and sailed close hauled for a while. 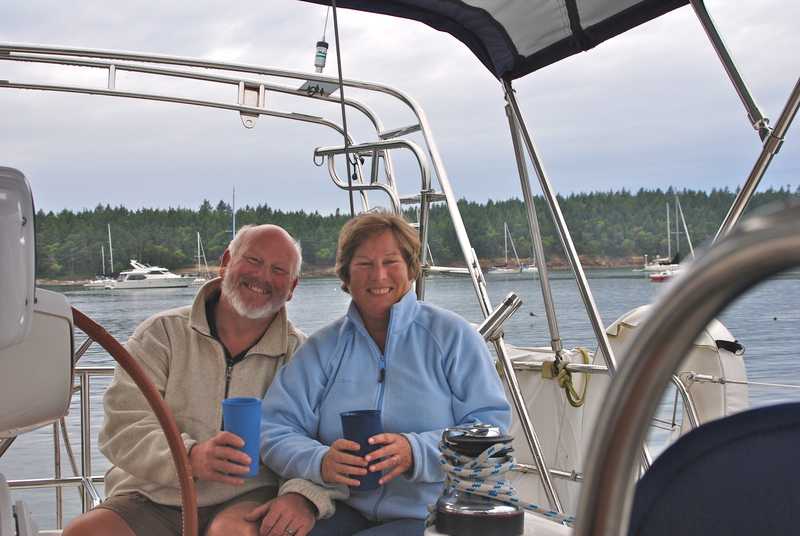 It was a rather busy day for the sail handlers (da boys), but Deb and I enjoyed an easy day on the water! Pretty soon though the wind started blowing high teens, low twenties, right on the nose, so we pulled in the Genoa and motor sailed. By the time we arrived in Bahia Salinas, the wind was right out of the north at about 18-20 knots. With the low part of the island blanketing us, there wasn’t much fetch there, so the wind waves were small and we trusted the forecast that said the wind would slow as the afternoon wore on. By dinner time we were floating on a calm sea in front of a huge half-moon bay of white sand and cactus covered hills. There is an abandoned town in Bahia Salinas that was the site of a large sea salt operation. In the 1980’s the town was shut town and the buildings have been left to deteriorate. There is a still a small church that is taken care of by a local care taker, and there is now a lodge that is the base for hunters who tour the island looking for big horn sheep. With our sights set a little smaller, John and I set about diving for chocolate (Cho-co-Lat-tay) clams that are prolific there. We each had a good-sized bag full in less than an hour, so we were all set for the next night’s dinner. For our first night at anchor we were also in luck as we’d run across Tramp, captained by KO, another cruising buddy from Sail Alaska – what a grand coincidence! AND they had fish to share – even better! So we dinghy-ed over for dinner and a get together on Tramp. Fun times. The next day we snorkeled around the wreck that is out in the center of the bay. It is said to be the beloved 120′ supply boat “Guaymas” that for decades sustained La Salina’s workers. It sank while returning for one last load of the workers’ belongings. It sits in about 30′ of water, so it’s a perfect spot to snorkel around and see all the fish that have made it their home. Marty did his best to snag dinner, but the fish weren’t having anything to do with that! 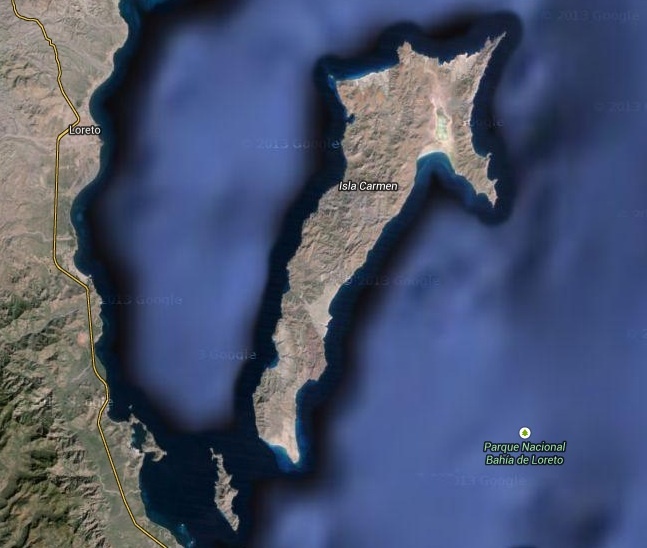 After a couple of days of sun and fun in Salinas, we headed around the north end of Isla Salinas to Bahia Ballandra on the northwest corner. The bay is only 3 miles from Salinas as the pelican flies, but it was about 20 as Happy Dance sails! Along the way we had a “rutro!” moment when the depth sounder went from 200′ to 18′ in a very short distance. Even though we had given the charted reef a good half mile clearance, we still weren’t far enough away! We did a quick U-turn, and then headed out a little further into deep water. Sailing in Mexico does have some unexpected speed bumps, made even more challenging by the charts that are essentially worthless! Bahia Ballandra turned out to have some awesome snorkeling along the rocky shores. Lots of activity and variety – perfect for a last hurrah for our land locked visitors. Our sail back to Puerto Escondido included some nice winds, dolphin sightings, and dorado wishes (nope, still haven’t caught one). We spent our last night together at the Tripui Resort, a local restaurant within walking distance of the harbor, enjoying chicken mole and chile rellenos. So, for all you sailor wannabes, now you know – it can be done! Happy Dances can be enjoyed anytime anywhere with the happiest dancing crew this side of the equator. All it takes is a plane ride, followed by a taxi ride, followed by a dinghy ride, followed by knowing the magic password to break through the force field into the land of laughs and dancing hobbits. Call today to set up your custom travel package – our happy customer service agents are awaiting your call! Hang on or get swept to sea! (hollering…..) STOP SMILING and looking so happy all the time! Sue, you entertain me with your narratives. Each post is more relaxed and fun as you shed clothes (strike that) I mean the very last bits of stress left over from your old lives. Embracing your Perpetual PIcnic (or whatever you called it way back when) with gusto and joyfulness enriches all of us who witness it from afar. As much as I love your travelogue I am always excited to see photos which bring the written words to life. Thanks for taking me along on the adventure. I’m having a great time and I don’t even have to apply sunscreen! Wow!!! Where is that phone number again??? I want to play too!!! You all look so relaxed and so happy, no wonder you are dancing all over the place!! I’m making my reservations as soon as I can!!! Let mew see when will that be again? June? doubt it. July? A Possibility?, August? Hmm? Jury Duty?? Sept.? another cutover.. Hmmm? July may be a possibility, where will you be??? Hi – Still enjoy reading your updates! Sail on! sounds awesome! love the pics of the shipwreck. cool!